When mystery novelist Eja Kane’s best friend CeCe Swann misses their brunch date because she’s fallen from the penthouse garden of a 30-story apartment building, Eja knows it’s not suicide no matter what Police Lieutenant Euphemia Bates says. That last slightly irreverent statement sets the tone for the rest of the story. Eja has more reasons to believe CeCe didn’t jump. Her friend had a fear of heights so debilitating she’d sought professional help. And also . . . she was in love. That said, Eja decides to vindicate her friend by proving CeCe was murdered. Deming, Cece’s twin brother, also has his doubts and in his usual high-handed manner, barges in, taking over Eja’s investigation. Friends with the twins since grammar school, Eja has never gotten along with Deming, partly because of his looks, partly because of his condescending attitude toward her writing ability. Needless to say, this time Deming and Eja declare a truce to discover who would want to kill the woman they both cared for. With an eye to protecting CeCe, Deming suggests they search her townhouse to make certain there’s nothing of an unsavory nature lying around. Deming and Eja search but nothing yields a clue. Then Eja finds a ring. CLS from Raven. Who’s Raven? And what was he to CeCe? The mysterious giver of the gift becomes their first suspect. With his father’s fortune and influence behind them, as well as Deming’s monstrous self-confidence, the Swann heir and his sister’s best friend abruptly discover something much more devastating than Cece’s murder. Does it complicate matters or not? Now balancing romance against the rapidly growing list of suspects, including a blackmailing psychoanalyst, a greedy ex-husband, and Deming’s ruthless cougar of a law associate, as well as the mysterious Raven, Eja’s not so sure their love will survive any discovery they make. Romance notwithstanding, a new clue pops up, and it’s a very important one. CeCe loved to win, and recently she’d lost a very important case—with more than a bit of scandal accompanying it. She swore to discover the reason why and the entire law office was abuzz with rumor. 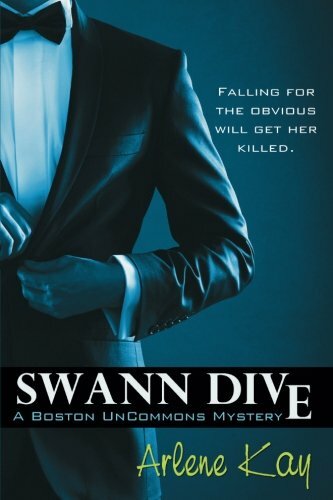 The discovery of the murderer proves the least guilty looking may sometimes be the most, that an airtight alibi isn’t necessarily so, and sometimes those admitting their involvement are even more guilty than one is led to believe. . . .
Swann Dive may have a contemporary setting but its snappy repartée between Deming and Eja is reminiscent of the comedy-mystery movies of the thirties. Eja makes a definitely appealing miss, independent while secretly vulnerable as she lives on the edge of high society through her friends. Deming is the epitome of the brilliant, self-assured young man, appealing to women while at the same time oblivious to the one who’s been within reach the entire time. The growth of their discovery of each other never outshines their hunt for CeCe’s killer but neither is it overshadowed by their search. The story’s an entertaining first entry into the Boston Uncommons mystery series.